LTE subscribers worldwide will reach 198.1 million in 2013, up a remarkable 115 percent from 92.3 million last year, according to an IHS iSuppli Wireless Communications Special Report from information and analytics provider IHS (NYSE: IHS). Since being adopted in 2010 with just 612,000 users, the 4G next-generation wireless technology has grown by leaps and bounds, surging by an astounding factor of 22 to 13.2 million subscribers in 2011, and then jumping another 599 percent in 2012 to nearly 100 million subscribers. By 2016, LTE will claim more than 1.0 billion users, as shown in the figure below, equivalent to a five-year compound annual growth rate of 139 percent. Globally, wireless network operators have been continually building the infrastructure for LTE technology, driven by increased appetite among consumers for faster content delivery, feature-rich applications and expansive mobile services such as social networking. While the majority of early operator activity was concentrated in Europe and Asia, North America propelled new subscriber activity in 2011 and 2012. The bulk of growth during the last two years also came from smartphone upgrades, especially as 4G LTE technology hit top-of-mind for data-savvy consumers. This is because more than any other type of phone, smartphones are able to take further advantage of the faster data connectivity provided by LTE, which leverages the kind of low-latency, always-on mobile broadband service that consumers now demand. But even as LTE has become the de facto global standard for 4G over WiMAX, an early rival, interoperability across multiple carriers and spectrum holdings is far from consistent. While the precursor 3G technology was deployed over a handful of spectrum bands globally, LTE so far has registered more than 40 different frequency spectrums, resulting in a complex landscape for equipment and component suppliers. Even in the face of this difficulty, the advantages to be derived from LTE are nonetheless substantial. Compared to previous cellular standards, LTE with its low-latency performance allows the handling of a wider range of applications, such as live video streaming, video conferencing, voice over IP and realtime multiplayer gaming. These new applications, in turn, create fresh market opportunities for component supplier and device manufacturers. 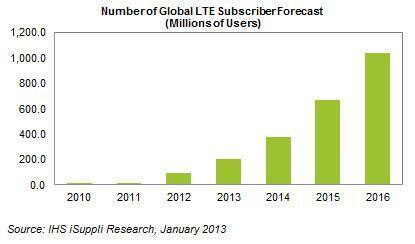 In particular, LTE is a force multiplier for innovation among smartphones. To take advantage of a more capable network, device manufacturers are accelerating the pace of innovation for applications processors, touch-screen displays, camera technology and ever-more sophisticated mobile operating systems and software. Such device innovations, in turn, will create ever-more capable smartphones.